In my last two blog entires on SharePoint and SAP, I introduced the problems that SharePoint and SAP Integration may be able to solve. In this article, I talk about what are the different approaches available to provide this integration. There are a few different ways that SAP business processes can be exposed in SharePoint. Providing a link from SharePoint to SAP portal or providing an iView-based Web Part in SharePoint. This kind of the integration option does not really solve the problems listed in the last article — UI simplification or employee or partner enablement. Programming to connect a SharePoint form page or a list page to retrieve, or push data into an SAP process via the SAP .Net Connector, or the Microsoft BizTalk Adaptor for SAP. This is a valid approach to solve the problems mentioned above; however it requires the availability of many different skill sets such as .Net Development, SAP technical skills, SAP functional skills, and SharePoint skills. This kind of a programming approach should be considered for complex or highly interactive scenarios or for scenarios where the interaction performance is critical. Using Duet Enterprise. This is a product that Microsoft and SAP expressly designed to allow SharePoint and SAP integration and can be a good option for a deep integration between SharePoint 2010 Business Connectivity Services (BCS) and SAP Enterprise Services. It also provides excellent single-sign on and reporting capabilities. Duet Enterprise again requires the availability of many different skill sets – .Net, SAP technical, SAP functional, and SharePoint. As before, this approach should be considered for a complex, highly interactive, or high-performance uses. Using a non-programming business-driven approach. 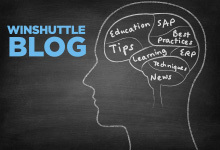 This is a solution that is offered by Winshuttle, allowing someone with SAP functional skills and basic SharePoint knowledge to build solutions that expose SAP functionality in SharePoint. The solutions built via this approach may not cover all possible scenarios, but would allow many low to medium complexity scenarios to be built and deployed very quickly and cost-effectively. More details about the Winshuttle approach will be coming in the next blog entry.